Zombie Island developer Vizor Interactive has announced the launch of its newest Facebook game, Klondike: The Lost Expedition. The game takes players to the Snow Peaks Valley in search of our hero’s father, a lost gold-digger. Using clues from the locals, players will investigate their father’s disappearance, while also building a new life for themselves on the frontier. Similar to games like Pioneer Trail, Klondike: The Lost Expedition sees players completing quests by feeding animals, farming and clearing debris like weeds, rocks and trees from their land. The locals can be used as additional helpers, chopping down trees or completing tasks that would otherwise require too much energy to complete alone. An in-depth crafting system sees players turning the raw materials and crops they’ve collected into better items, like tents or lanterns, and players can purchase these materials with premium currency (or real money) if they’d rather not take the time to earn them for free. So far, Klondike: The Lost Expedition has just over 10,000 players on Facebook. While only available for a few weeks, the developer has already implemented suggestions from fans, including a hint system for finding collectible items, new items in the game’s store, and reductions to the prices of clothing items, feed for animals and requirements for producing several items. 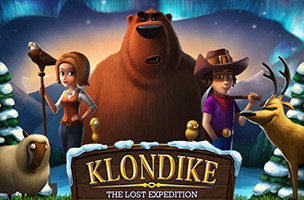 Klondike: The Lost Expedition is available to play for free on Facebook. You can follow the game’s stats on AppData, our tracking service for mobile and social apps and developers.